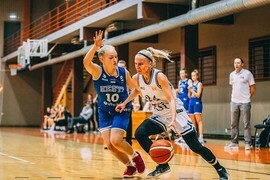 SK "Cēsis" (3-0) continue their perfect run in the Nordea league "Top 6" tournament. Armands Krauliņš and Uģis Viļums side took 13th consecutive win and hold their ground against the Estonian champions "Eclex Tallinn/1182" (0-1). Final result – 69:56 (20:18, 19:13, 19:16, 11:9).